The Run button on the Analyze dialog performs the analysis specified in the dialog. 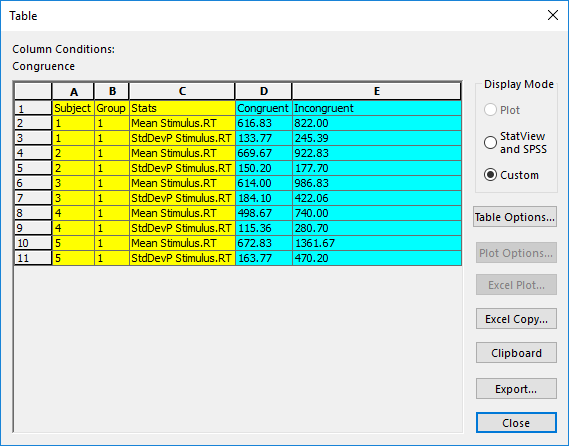 The results of the analysis are displayed in table format in the Table dialog, and may be copied to the clipboard using the Clipboard button, or exported to a text file using the Export button on the Table dialog (See E-DATAAID: Exporting Data ). When a table is generated, the Column Conditions field at the top of the Table dialog indicates the names of the variables with a column orientation (if any). The Column Conditions field is read-only. In order to change the columns within the table, return to the Analyze dialog and modify the Columns list. 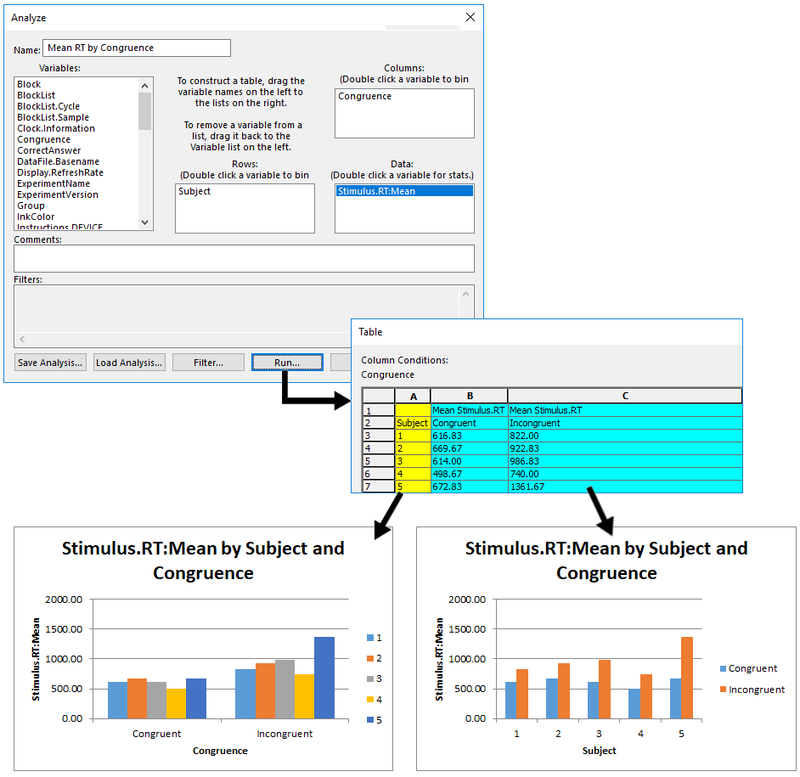 The table portion of the Table dialog contains the results of the analysis. The table is color-coded to aid in the reading of the table. The Table dialog allows the display to be altered depending on its intended use. 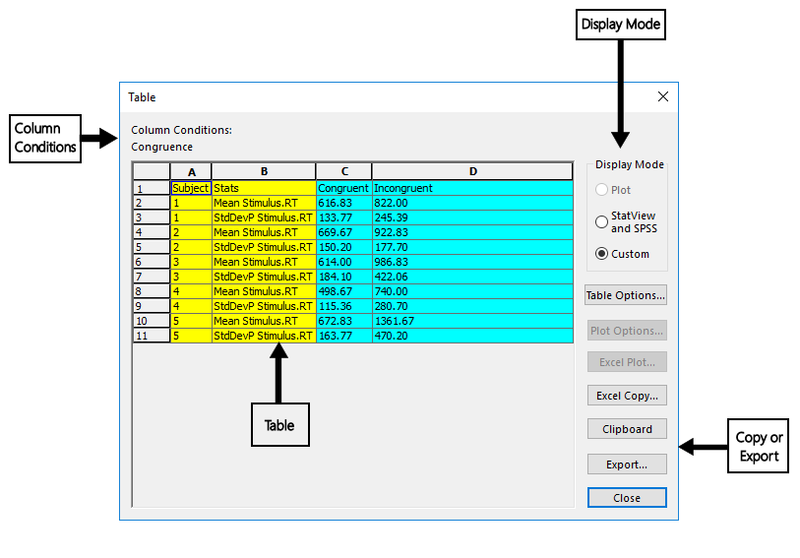 The Display Mode options to the right of the table offer multiple display modes (Plot, StatView and SPSS, and Custom). Plot– The Plot display mode formats the table so it can be plotted in Excel. This mode is disabled for tables that collect more than one statistic. For example, a table can plot mean reaction times or mean accuracy, but cannot plot both. StatView and SPSS– The StatView and SPSS display mode formats the table so it can be exported to a text file for later import into StatView or SPSS . 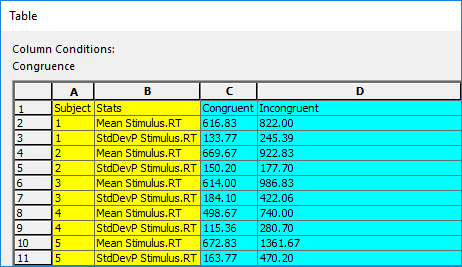 For example, a table of Mean RT by Subject may be imported into StatView in order to perform an ANOVA on the table data. Custom– The Custom display mode formats the table according to user specifications. This is the default setting. Use the Table Options button on the Table dialog to customize the table’s format. 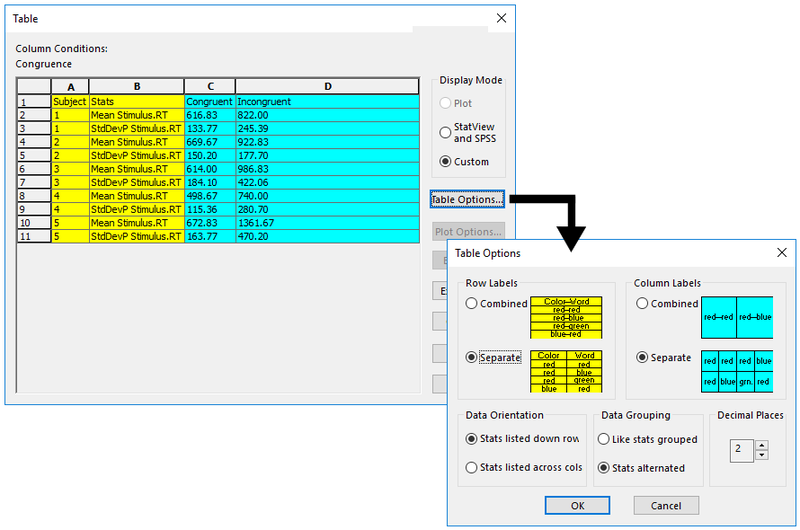 The Table Options button allows the setting of display properties for a table generated from the Analyze dialog. 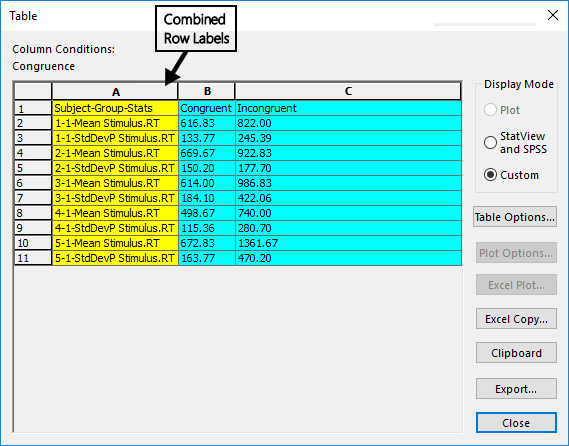 The Row labels field defines the orientation of the labels for the data collected for the variable(s) specified in the Row field, as well as the statistic(s) used to summarize the data. These columns are displayed in yellow in the table. 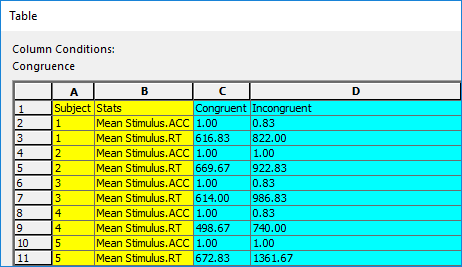 For example, if one variable is entered in the Row field in the Analyze dialog (e.g., Subject), the resulting table would contain at two yellow columns labeled "Subject" and Stats. 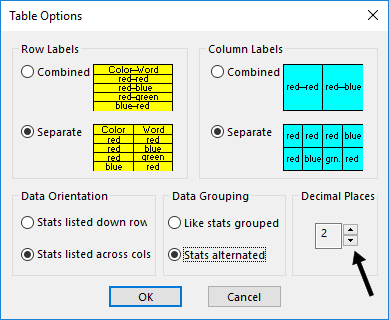 If more than one variable is designated, the resulting table would contain multiple yellow columns labelled with "Stats" and the variable names, as illustrated in the image below. The image above illustrates selection of the "Separate" option within the Row Labels field. The "Combined" option combines all row labels into a single column, as shown in the image below. The Row Labels option may only be changed if the Custom display mode is selected for the table. 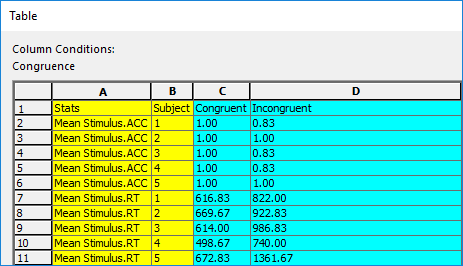 The Column Labels field defines the orientation of the labels for the data collected for the variable(s) specified in the Columns field, and are displayed in blue in the table. When an analysis is run, the resulting table will contain one column for every combination of levels for each variable in the Columns Field. The labels for these columns will not be the name of the variables, but rather the name of the combinations of each level of the variables. For example, in an analysis involving two variables specified in the Columns field (i.e., InkColor, Congruence), the figures below illustrate Separate vs. Combined Column Labels. This option may only be changed if the Custom display mode is selected for the table. Data Orientation refers to the orientation of the labels for the dependent measure(s) in the table. If these labels are displayed with a row orientation (Figure 3), the table treats them like row labels (i.e., they are displayed down rows in yellow). 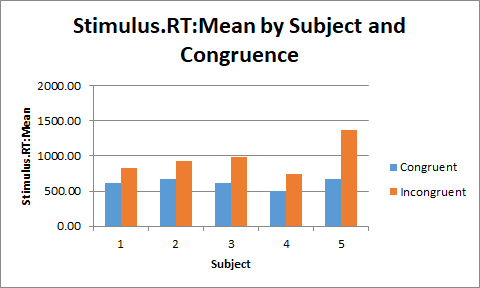 If these labels are displayed with a column orientation (Figure 4), the table treats them like column labels (i.e., they are displayed across columns in blue). Data Grouping refers to whether the data in the table is grouped or alternated by dependent measure(s). For example, in a table of mean reaction times and mean accuracy rates by subject, the measures (reaction time and accuracy rate) can be alternated by subject (Figure 5), or statistics be grouped by measure (Figure 6). Note that the labels for the dependent measure(s) in the table are always arranged alphabetically within the selected grouping regardless of their order in the Data field. The Decimal Places field in the Table Options dialog allows the user to change the number of decimal places (0-6) displayed for the statistics. Exceptions include the Count, CountNum and CountNull statistics, which are always displayed as integers. In the Decimal Places field on the Table Options dialog, use the arrows to set the number of decimal places. The default is two decimal places. This option is available for all display modes. 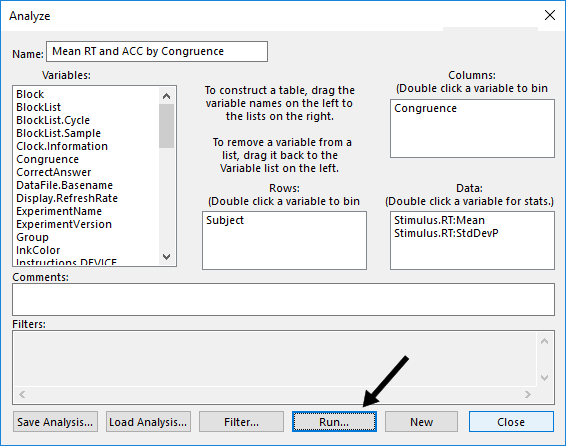 The Plot Options button allows the setting of plot properties for a table generated from the Analyze dialog. This button is enabled only when the table is in Plot display mode, and plots may only be generated for tables containing a dependent measure, such as mean reaction time or mean accuracy. The Type option allows plotting the table as a Column (Figure 7) or Line chart (Figure 8). In the Type box on the Plot Options dialog, select the plot type in the drop-down list. The default Type is Column. The orientation option allows data to be plotted by columns or by rows. 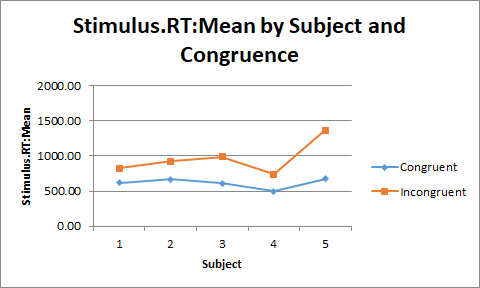 When plotting by rows (Figure 9), the level combinations of the variable(s) in the Rows field of the Analyze dialog (e.g., Subject) make up the chart’s legend (i.e., labels from the yellow columns of the table). When data is plotted by columns (Figure 10), the level combinations of the variable(s) in the Columns field of the Analyze dialog make up the chart’s legend (i.e., labels from the blue columns of the table). In the Orientation box on the Plot Options dialog, select “Column” for a column orientation or “Row” for a row orientation. The default Orientation is Column. The Y-Axis Scale option enables or disables the automatic setting of the y-axis scale values by the application. By default, this option is set to “Auto”, indicating that the application will define a scale based on values contained within the data. To set the y-axis scale manually, uncheck the box, and enter a minimum and maximum value for the y-axis. 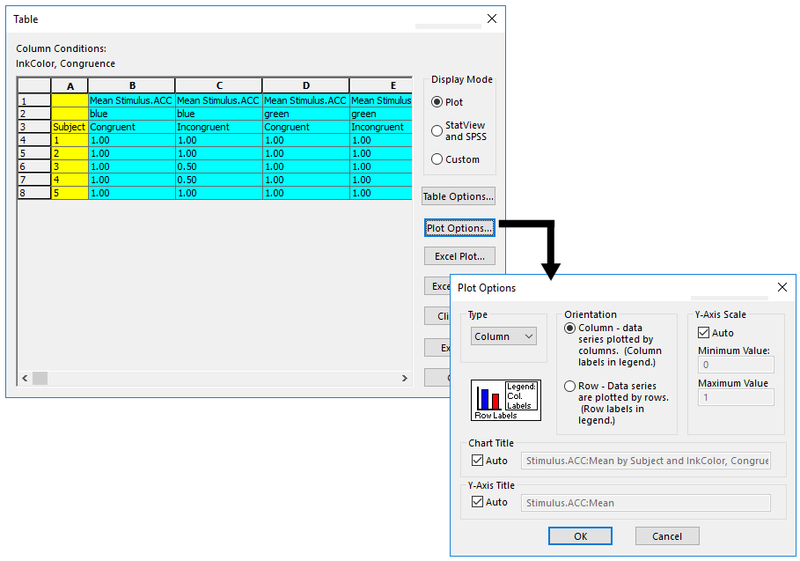 The Chart Title option enables or disables the automatic setting of the title for the plot by the application. By default, this option is set to “Auto”, indicating that the application will set the title. To set the title manually, uncheck the box, and enter a chart title. The Y-Axis Title option enables or disables the automatic setting of the title for the y-axis by the application. By default, this option is set to “Auto”, indicating that the application will set the title. To set the y-axis title manually, uncheck the box, and enter a title for the y-axis. Note: This function requires the installation of Microsoft Excel. The Excel Plot button automatically plots the table in Excel. 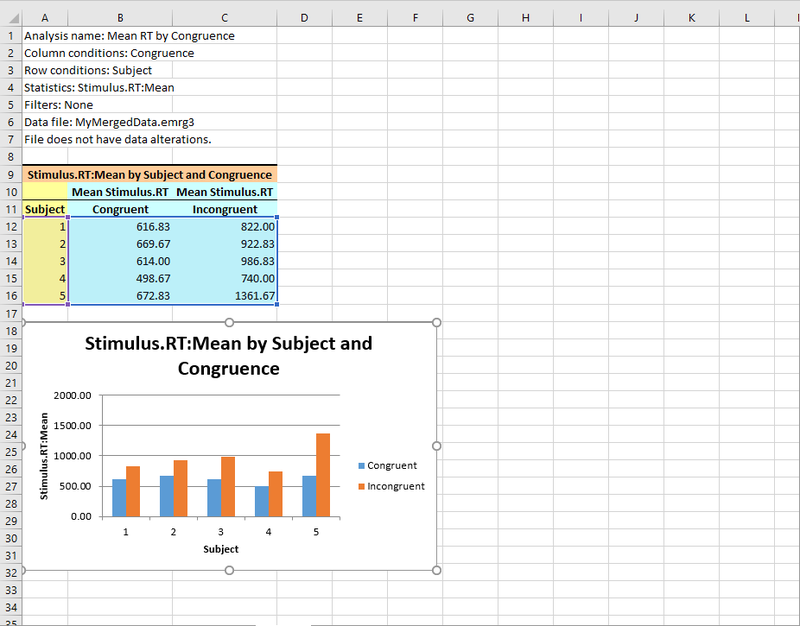 The Excel Plot button is enabled only when the table is in Plot display mode, and only tables that contain one dependent measure (e.g., mean RT, mean accuracy, etc.) can be plotted. When plotting in Excel, E-DataAid adds a worksheet to the active workbook. If necessary, E- DataAid activates Excel and/or opens a new workbook, then copies the table to the Excel worksheet, applies formatting, and graphs the data. The Excel Copy button automatically copies the table into Excel. All tables, regardless of the number of dependent measures or display mode, can be copied to Excel. When copying to Excel, E-DataAid adds a worksheet to the active workbook in Excel. If necessary, E-DataAid activates Excel and/or opens a new workbook. Then, E-DataAid copies the table to the Excel worksheet and formats it. The Clipboard button copies the table to the clipboard. The table can then be pasted from the Clipboard into another application. The Export button displays the Export dialog in order to export the data to a text file. Refer to E-DATAAID: Exporting Data  for information pertaining to exporting options. The Close button closes the Table dialog and returns to the Analyze dialog.